Even small steps forward, is still progress, it is not the size of the step, it is the direction. I am starting to feel like I am making some progress on several endeavors. Since I just came in from Kyudo practice I will start with that. There was a Rei Kai today. It took me a while to figure out it is Rei Kai, not Dae Kai, not that it really matters, it is just a label. The event is important, not what I called it. 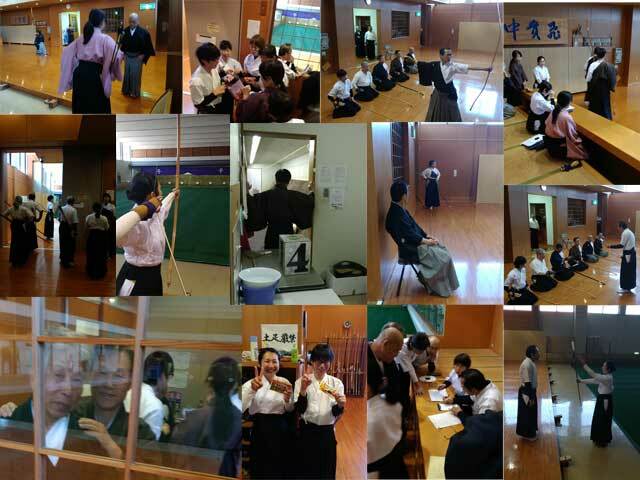 The ReiKai today was small as most of inner dojo events are. It was cold, I continue to be grateful we are inside dojo. I would have really suffered had it been outside. Still during break many were standing around our one little space heater, or had on their outside coats. The day went smooth, it was a relaxed day. My shooting was not great, I was able to hit one out of the first two sets , then as I made adjustments I hit two out of the last set of four. After that time one of my Sempai Sensei said something to me, as him another Sensei who often helps me had been watching my shooting and discussing it. The second Sensei, the senior seem very reluctant to say anything, but the other spoke up. My balance when shooting was off. I guess I was leaning into the shot too much. My pushing toward the mato was turning into a lean toward the mato. I made a note of it. The main shooting was over now was the time everyone shot again but instead of 4 arrow, it was one, per round. If you made the shot you continued, if not bye bye. I applied a correction to what I had been told. Instead of just pushing, I lifted my head and stretched my spine upward, like when doing Tai Chi, or sitting Zazen. Also then push toward the mato and away from it with the opposite hand. So as I had been told before or read, that it was more of a circular expansion not just vertical. To the Heaven and earth, and to the sides. So I guess not really round, but all around. I also did the tightening of the triceps as Yamashita Sensei had told me, upon release. The other thing was to place myself “in between the bow and the string. Aonther thing I had heard or read about, but I finally figured out the feeling. When I do it the ya goes straight, like an arrow :-). It is sort of leaning into the bow to place yourself in the middle. Technically I am not between the bow and the string, but it feels that way. I am not supporting the pull with my arms, and chest, but “body”, Bam , a hit, I thought I was done for a while. But I was called up again, Bam! hit, and a another time. I was in the finals. I missed my last rotation shot, maybe everyone else did as well. However, wow I was doing good. I am finally starting to understand, things are starting to click. Usually when I think like that, I find I am wrong, but so far this time it has held up. I still have a way to go, but I am making progress and have found the spot to aim from on my Yumi. Now more and more practice and I should be ready for the Shinsa this summer. Sato Sensei asked me was I going to the shinsa in March I said no, more practice yet. But I believe with continued practice Summer will be it. If not there is Autumn, and Winter. Also next year, if God be wiling and the creek don’t rise. Maybe these days it should be If God be willing and hte bombs don’t fall! Either way I am feeling good about this being the year of Yondan. The “Dog” is with me! 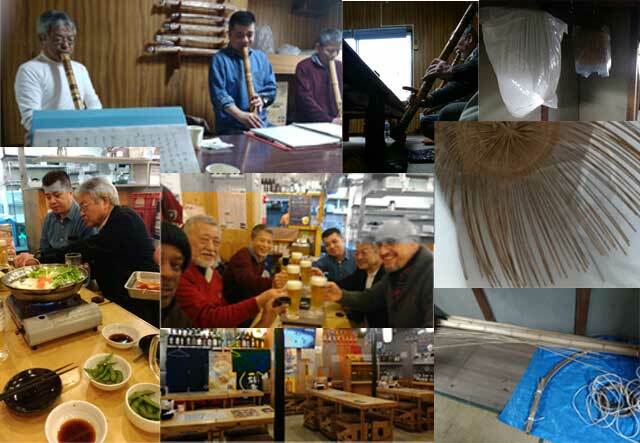 The day before I had my monthly meeting with the Shakuhachi group. A cold and rainy day, once agin we met at Oota- Sensei shop. This from what I understand maybe becoming out regular meeting spot. It is a bit rustic, but comfortable and no hassle to be there and no conflicts with other groups wanting to use the space. We went through the usual drills. I was able to play along on a couple of piece that I had not done before. For me that was a personal victory. Then everyone played the individual pieces they are doing. Finally it was my turn, I was not really excited about, but I did Choshi. The Yamamoto, version. I received some corrections and tips on playing. Then asked to do it again so I could practice. It was better, still needing work but better. I could hear a Sempai grunt an approval of parts I did correct. Afterwards he says, I do the last phrase well, I did need to work on the small adjustments. Another Sempai showed me how to correct one part. Later I was told I have good potential my tone is good. That was good to hear…yatta! I also decided on the Shakuhachi I wanted Oota-Sensei to make for me. I heard a couple of different sizes being played and my ear was most pleased with the 2.0. It was told to me later by another Senpai about having six hole instead of 5. I had not thought of that, but upon hearing it said and explained why, it is a good idea for my experimental flute. It will take some time before it all comes together. Oota-Sensei will have me select the Bamboo I want as the next step, now that I have chosen the size. I was given the application for joining the Myoanji temple. This was helpful. I can fill out the form before meetinG with Matsutani-San next month. The Sempai who gave me the application, told me later that he would be my sponsor if needed. I thanked him told him that Matsutani-San a friend of my Sensei said he Would sponsor me. 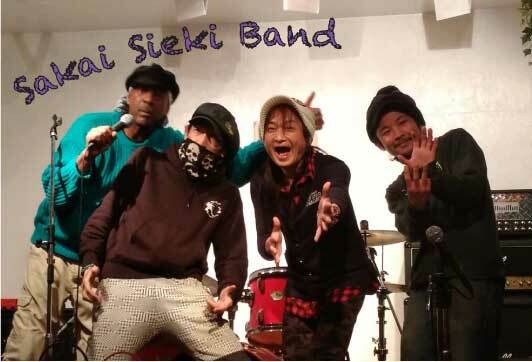 The Sempai said, ohhhh, yes, you should go with him as a sponsor he is very well known…Yatta, Another plus for me! So process is being made. The new band is feeling positive, Kyudo is feeling positive, Shakuhachi world is also feeling positive. I need to crack down on my Japanese study next. still…The year of the Dog is off to a good start…Yosh! Well travel time is over for a while, sort of, a couple of small trips still on the horizon, but nothing to write home or blog about. On the Music scene …thankfully my Shakuhachi has been repaired. 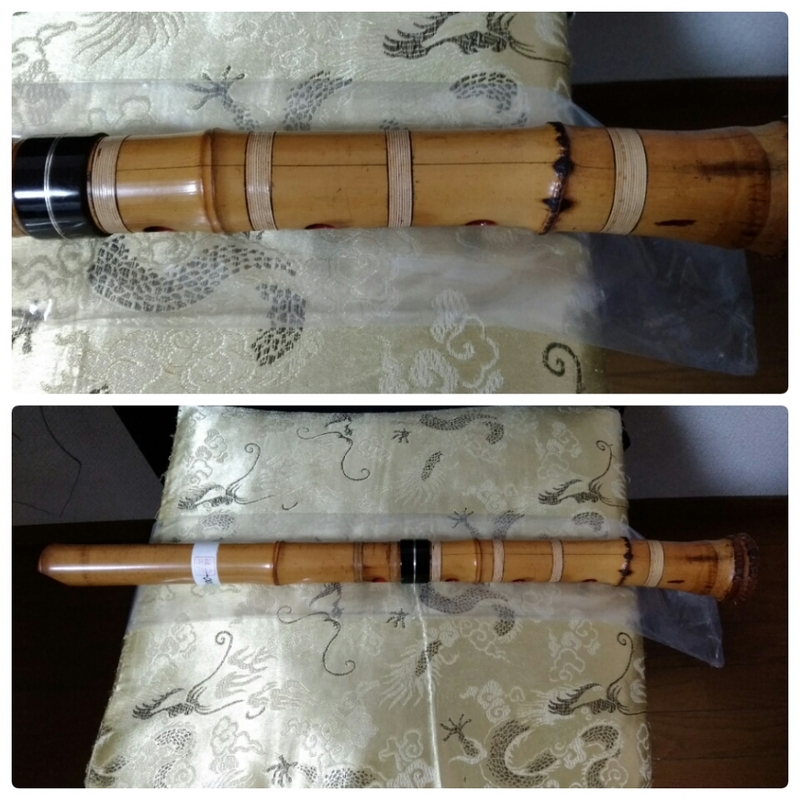 My Sensei took it to his friend, who he says is one the of the number top Shakuhachi makers in Japan. This makers usually does not do repairs on other makers instruments, but as a friend he is doing/did it. The maker did and outstanding job also much much cheaper than the original repair person I took it to. That guy was really more into selling me a new one than repairing mine. So now I have a nice whole flute again. He not only fixed the crack but the joint as well. I like the wrapping he did. It gives the flute “character “ and that cool old school Shakuhachi look. Sensei and the maker said even though my shakuhachi is not a professional level model it is still a good flute. Especially says Sensei for playing Honkyoku songs. He says it is rare to find this type of flute these days as most makers are making “modern” sounding flutes. Tuned to western pitch and louder playing. So I am pleased to have it back. I have also learned to take better care of it when it is resting. Now I can really crack down on my practice for the up coming event I am scheduled for in March. I will be doing my first public performance in front of serious players at a Buddhist temple event. This a big deal for me and it sort of coincides with my 3 years of lessons anniversary. At this event I will meet a Komuso who is to be my sponsor for joining in the Miyonji Temple as a “real” Komuso. Again something that really only matters to me and in the large picture of life means nothing. Isn’t that the same with most of our individual ego trips, adventures. Gives a little boast to our own self-image. On the other hand, who knows what help, lift it will give someone when out as a Komuso to someone who hears the music. Lastly, I will be placing my order for a new Shakuhachi this weekend. I have settled on what I want. I will order it from one of the members of the classical Shakuhachi Society I play with once a month. This is the member who gave me the large Shakuhachi which I enjoy. I have decided on one in between the 2.5 and the 1.8 cm I like the deeper tone of the larger flute over the smaller. The larger one though is more difficult to play, more so I think with “modern” songs I want to play. If I am wrong I will just make due with it and adjust to the song. At least that is the plan. Man makes plans, God laughs is a saying. On the band scene, we have had our second rehearsal with the new band. A keyboard player has joined us. It really helps round out the sound. Another plus with him is he also sings so we can work on some vocal harmonies that really adds to the band sound. I heard from the blues “Doctor” that the band has been selected to play again this year at the big city Blues Festival, however we will be once again in the small club. Reason being our vocals are weak. Quite understandable. Really we have none. The “Doc” is a weak singer and we never practice on vocals, well on anything really. I have on a couple of songs tried to “hear” a harmony with him but he is difficult to harmonize with, not really an expressive voice, he plays better than sings. Which is ok, for the blues, but limits the band appeal. I am still waiting to see if I have been selected to do a solo act at the festival. The choices are selected and posted on Sat. We took a taxi to our new hotel. This was the place my wife was looking forward to staying at. The first place was a business hotel. It was nice and comfortable, this new place was uptown. She is into luxury resort style. For me clean sheets and heat or a/c is good. We arrived sort of early by a couple of hours or so, but our room was ready ! It was not the best of the best, low level luxury . It was nice. We had a poolside ocean view. Roomy very comfortable . She was happy. There is a saying when the wife is happy, everyone is happy! There was no going out and around town for me, I was in. There was a Veggie restaurant I would have like to visit but it was too far to walk. Also another Buddhist temple, also too far to walk. So I sat on the lanai and chilled. I did some reading and practiced shakuhachi. LZ wanted to go to the beach side at happy hour. So we were off. It was a bit cool for me so I wore a jacket, which was a good plan. We got the beach spot she had reserved ahead of time. The drinks were good. The nachos I ordered sucked! SUCKED! Flavored Doritos, with sour cream and cheese, with guacamole. seriously sucked! I was disappointed oh well! I rolled with it. The drink was good. My first time ordering a Singapore Sling. We hung out there for a while until dark then headed back to the room. While she was handling the charge I noticed there was a Tai Chi class the next day from a posted sign, and took some pictures. We did the usual resort thing for dinner then just chilled afterwards. Nothing really interesting, I read more and practiced. The next day I was up early. It was setup by LZ as a free day, meaning I did not have to follow her. I could do whatever, as would she. I got up early to check out the Tai Chi class. There was none! I asked the help and he called for the instructor. So it was a private as needed class. Ok. I waited for the Shifu to show up and just sat on the beach. When he arrived I clarified there was no group class just a private session if I wanted. Nice if that was what I wanted. I explained through a translator that I was just hoping to join the class, as I also was a teacher. Ok, that was cleared up I said I could just practice on my own if there was no class. I asked what style he taught. My Tai Chi Mantis Grandmaster taught Tai Chi in Vietnam for many years. I was sort of hopeful that is what he, this Shifu taught, I could use a review on that . No he taught Yang. I said thank you, I would just practice alone. We gave each other the traditional salute and he left. I found a quiet spot did some Zazen and then just went through a couple of Tai Chi sets and Hsing Yi, before gong back to the room. The rest of the day was pretty quiet, reading, shakuhachi. Lunch, then dinner. Chilling. In the evening we went to the main lounge and sat. There was another Japanese couple there, we did not talk, I just heard them speaking. I did say something when we were leaving. The guy came over and looked at an art piece I was checking out and told LZ about. It was a couple of bike rims with paper cranes. The guy came over to check it out when I made a big deal of it to LZ. I said amazing ne! In Japanese. He responded hai and that was it. Not very friendly, oh well. The next day I repeated the scene but just on my own. Took more pictures, practiced, walked in the beach barefooted. That was nice. It reminded me of an article I had recently read about people needing to connect more barefooted to the earth. It had been a while since I did that, so it was very nice. I could feel the “Chi” of the earth. The day wrapped up and we checked out and headed for the airport. Once checked in we did a little gift shopping for a couple of people, including my Kyudo classmates, candy. The stores in the States that have Chinese owners are usually not friendly, almost rude. Very unlike Japanese store owners or even just personnel. The Vietnamese working in these shops were like that. Not kind, not rude, but close to it. Mostly ignored you other than following you around. LZ also noticed it. So it was not just me. Right at the gate there were a couple of shops. While waiting I checked them out as well even though we had purchased the gifts we needed. The personnel were the same…distant. All but one store I went in. The woman was helpful friendly and spoke English. There was a couple of things I saw I wanted to get. One of which was also at another shop next door, a little cheaper. However I went and purchased it from the polite woman. I told her I was buying from her because she was kind. She thanked me. We chatted a little while and she helped me with an issue with paying. Turns out it was the store’s machine not my problem. Anyway it got worked out. I left with a good impression. The plane started loading, I made a dash to the toilet just in case. When I got back LZ was standing at the gate ready to check in. I rush up to the check-in and a guard in the funky military color uniform stops me asks for my passport. He had seen me, as I had seen him earlier. I just showed it to him and said nothing . I was given the ok and went to check on to the plane. I did not see him do that to others getting in line, oh well. Normal stuff for a person of color, roll with it. Vietnam over all was ok. I liked the weather while there. The people staff at the hotels were nice, of course. The people at the restaurants I went to were nice enough. The regular people that I encountered were nice enough. Would I go back? no. No desire, once was enough. I liked Taiwan better, the food was much, much better and there is more things of interest for me. I was surprised how, any Buddhist temples there were in Vietnam for a communist country. I was even asked on the visa application what religion I was. That was different I guess. However I have never needed a Visa before, so who knows. Anyway. It was a pleasant trip over all. I like Japan better and the women are cuter. I am grateful I got to see Vietnam and not have to carry a gun and shoot at people or visa versa, to do so.